SeaDreams hat gerade einen massiven Innen Verjüngungskur, die die Zugabe einer modernen Küche, neue High-End-Geräte, Frühstücks-Bar, eine private Bar-Bereich, und Entertainment-Center umfasst erfahren. Es ist die gleiche Aussicht und Lage Sie kennen und lieben, mit allen Annehmlichkeiten, die Sie erwarten, so dass Sie Ihren Traumurlaub im Paradies genießen. Die neue SeaDreams ist eine deutliche, gemütliches tropisches Paradies ideal für Privatsphäre gesinnte Paare. Das Hotel liegt am Ten Bay Beach auf der Bahama-Insel Eleuthera Sie sind in der Nähe der Natur und Schönheit. Die warme offene Gefühl durch die Kathedrale Decken zusammen mit dem Leben im Meer und karibischen Dekor versehen machen das Haus zu einem unvergesslichen Urlaubserlebnis. Kommen Sie nach Eleuthera und genießen Sie das Vergnügen, das ruhige Meer und die sanfte Brise. Entspannen Sie bei einem kühlen Drink am hohen Ufer, und das Gefühl der Spannung lassen Sie Ihren Körper als Klarheit der Gedanken und Geist Rückkehr. Dieses Haus ist vom Autor The Beach Buchen, Eleuthera, Bahamas Ausgabe, die ultimative Reiseführer zum sicheren Auffinden ALLE Eleuthera 135 Stränden gehören. Mieten vom Strand Experte der Insel. Ich vermiete auch eine 2-Zimmer-Haus, das in Winding Bay, Eleuthera, Bahamas auf der atlantischen Seite der Insel zu 6 Personen schlafen können. Wenn Sie ein größeres Strandhaus in einer südlicheren Lage bevorzugen, dann sehen Sie sich bitte meine anderen Angebote an. Das Haus war wirklich perfekt und die Lage - möchte man einen entspannenden Urlaub mit idyllischem Strand ist super! Auch die Annehmlichkeiten der Unterkunft waren sehr hochwertig und es zahlt sich auf alle Fälle aus. Ein Mietauto ist jedoch empfehlenswert - wie vermutlich überall auf Eleuthera. Beautiful spot, just the right size for the two of us. Loved the kayaks, bonefishing right out the door. Wonderful sandy beach with a shallow sandy bay. Great central location between Gov. Harbour and Rock Sound. Great base to explore the many beaches Eleuthera has to offer. Thanks Bret for writing the beach book, lots of great finds! The interior of this cottage is a bit dated but the spectacular waterfront view and being literally steps from the beautiful beach makes this such a worthwhile spot to stay. We enjoyed our coffee on the deck in the mornings and our wine in the evenings. Ten Bay Beach is quite secluded so if rest and relaxation is what you're looking for (and we were), this is the perfect place to find it. Glad you enjoyed your stay! 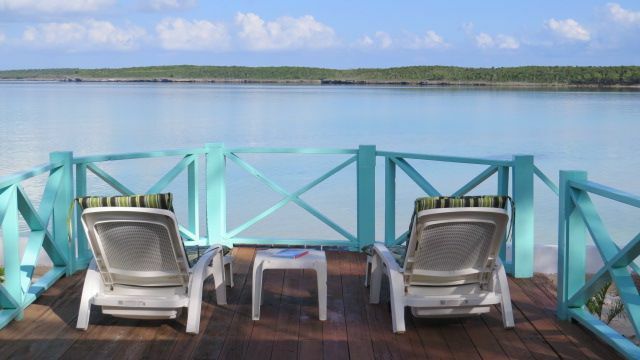 The view and proximity to the best beach on Eleuthera is certainly reason enough to stay at SeaDreams. To clarify on renter concerns, the entire interior was completely renovated in 2014 and I mean completely. The only thing still standing were the exterior walls and the roof. That project involved all new floors, tiling, both sets of sliders, appliances, cabinets, fixtures and most of the furnishings that people actually use including the couch, bedframe and new TV. The bathroom was 100% redone. We did keep a few functional pieces of furniture and art that we thought added character and also didn't require immediate replacement such as the two bedroom dressers, two living room chairs and the dining set. Those items we mended. For the past three years we have focused our time and investment on the landscape, which has been improved dramatically and for the better. We are now planning on turning our attention back to the few interior items that we think do need to improve - aforementioned items as well as window treatments and floor coverings. Some of those items will be taken care of next week when I am on the island. Unbelieveable! One of the most beautiful beaches we have ever visited. Very quite and private. Sea Dreams is a true beach house with everything you need. It was sparkling clean with a large deck right on the water. There were a few people on the beach but they were so far away you could hardly see them. It is private property all around the house. The beach was deserted most of the time and we walked and swam a couple of times a day. The sunsets from the beach were amazing. I can't wait to return. This rental was exactly like the pictures. No photoshop or crazy lens play. When you open the front door your eyes are drawn across the room to the sliding glass door and that magnificent view of Ten Bay beach with those calm turquoise waters of the Caribbean Sea!! Breath-takingly beautiful. You are truly mere steps from the beach. The rental itself was well maintained inside and out with quality furnishings, dishes and cookware (real wine glasses!!) and more linens and towels than my own linen closet. There were so many "little" touches that made a big impact...the coolers to take while beach hopping.. the cabinet full of scuba gear and water shoes....the sirrus radio.. the large outdoor grill... the whimsical decorative touches...the library,landline and cell for guest use.. The Beach Book! Every remote and light fixture is labelled so you don't have to guess. We thank you both for sharing your home with us. You obviously know how to make your guest feel comfortable. Can't wait to get back tp Eleuthra and Sea Dreams. This home is amazing!!! And Eleuthera... well there are no words to describe the island. The house had everything we wanted. Privacy. A view of the Caribbean that is unmatched. One of the best Caribbean beaches is just a few steps from the deck. We saw large island birds in the front yard, large hermit crabs walking in the grass, and tons of sand dollars out in the water. Also, the house is centrally located in the island which made exploring the top and bottom parts easy. My husband and I travel a lot... and this was the best vacation we have ever had.